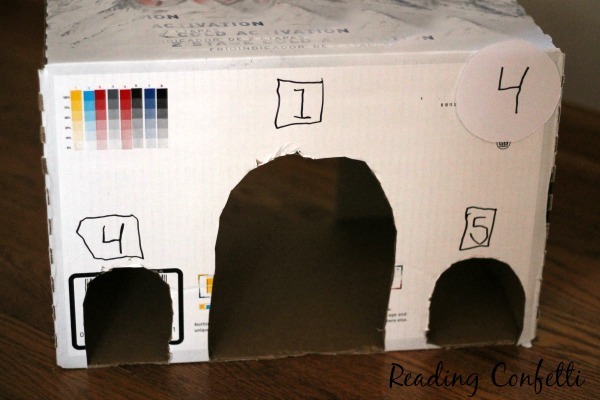 Here's a fun way to keep your kids entertained during Christmas break: build a miniature golf course from cardboard boxes! 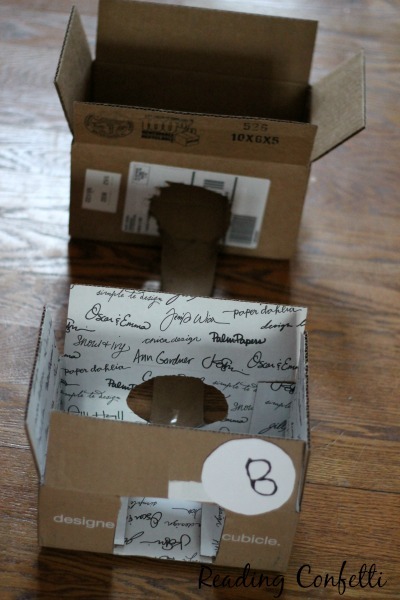 I did a lot of my holiday shopping online this year so we had some cardboard boxes piling up in the dining room. If there's one thing my five year old son can't resist it's a cardboard box. He started talking about an obstacle course and asking me to cut holes in the boxes. 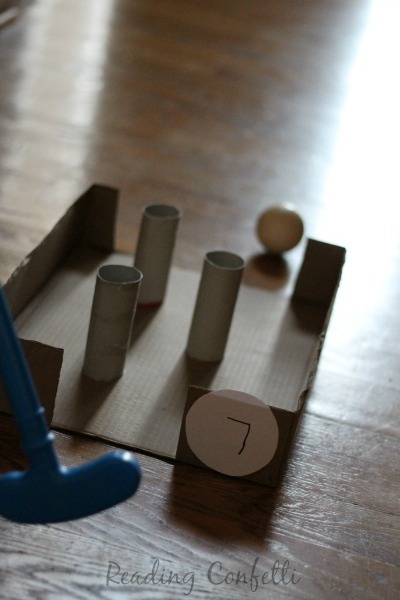 Then he got out his golf club and ball and I realized he was making his own mini golf course. 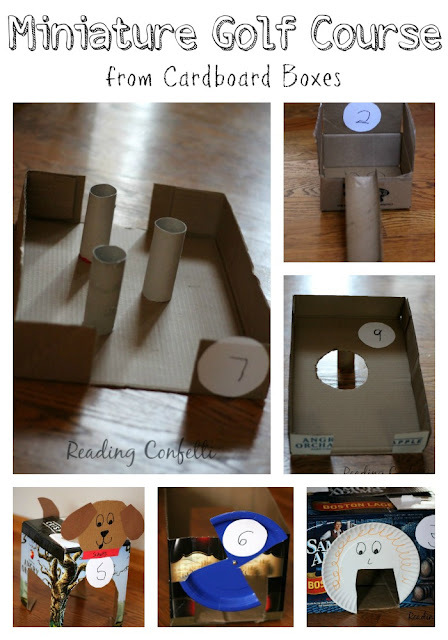 We worked together to come up with nine holes for his course and had fun thinking of ideas and testing them out to see if they'd actually work. I think we both got some physics practice too. 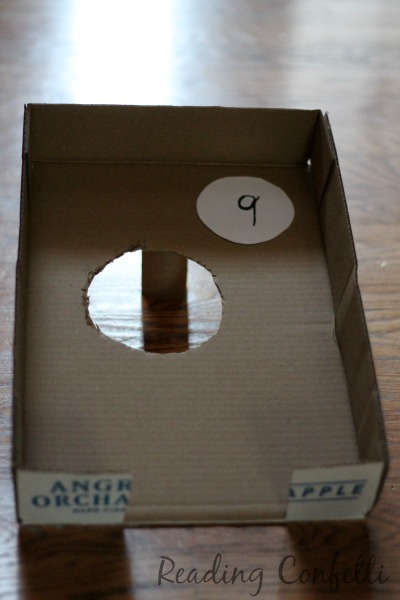 Of course, we had to label each hole so when he spread them around the house we'd know which one was next. 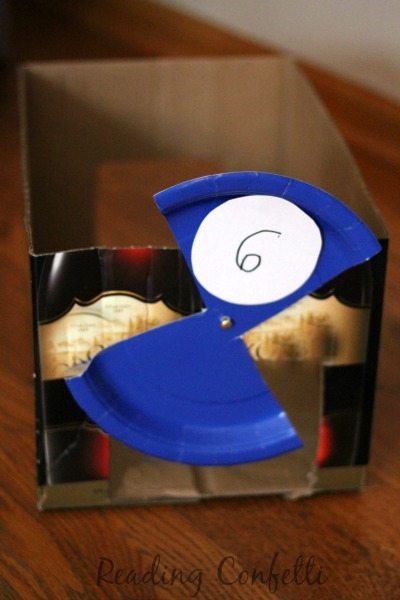 Hole #1: This is one of those things that divide liquor bottles. We added some tissue paper to each side. 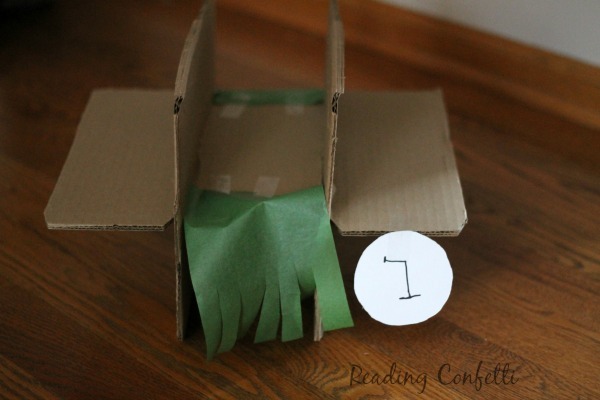 Hole #2: The ramp is a paper towel tube cut in half. Hole #3: Not our best one, but it works. Hole #4: Although we realize that there aren't different point values when you're playing miniature golf (and the object of the game is to get a LOW score) it's our game and we make the rules. Hole #5: Our favorite. Plus it's easy. You almost can't not make it through this one. Hole #6: This is our version of a windmill. It's a paper plate attached with a metal fastener. We give it a good spin. Hole #7: Empty toilet paper rolls hot glued to the box. This one should be a par 47. It's hard. I want to widen the opening at the other end but my son won't let me. Hole #8: He wanted one with a bridge and this is what we came up with. 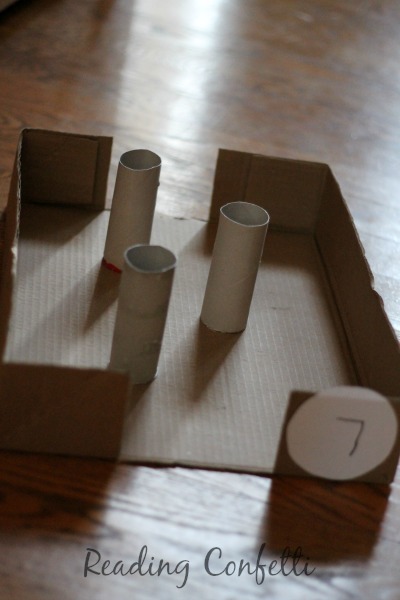 It's two boxes connected by a ramp made from half an empty paper towel roll. He can do this one, but I can't. 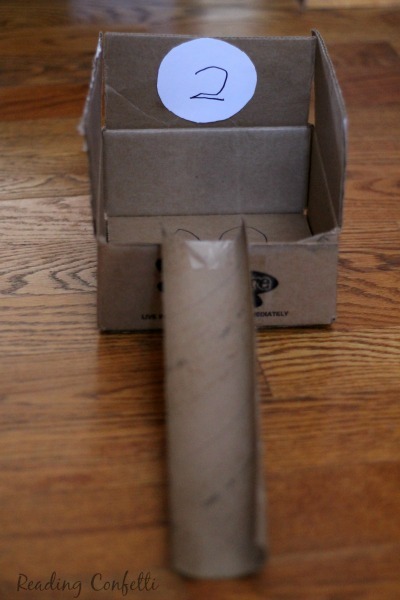 Hole #9: This one is propped up with an empty cardboard tube. Lots of these are liquor boxes. Don't judge - we are hosting Christmas for my husband's family this year and I'll need it. To serve to guests of course. Combined with my Christmas boxes, we had more than enough to build a nine hole course. If you don't have a big pile of boxes in your dining room, you can always stop by a liquor store and pick some up. If you do this and come up with some new designs, I'd love to see them. We have plenty more boxes. Love this! 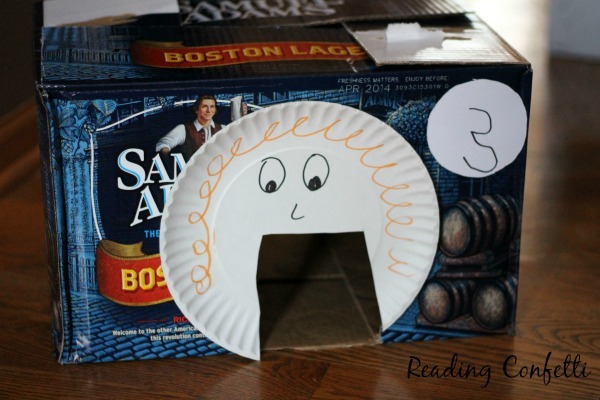 This will be so fun to make with all of those Christmas boxes! Thanks for the idea. I am adding it to my Great letter G for golfing. I love your golf course! 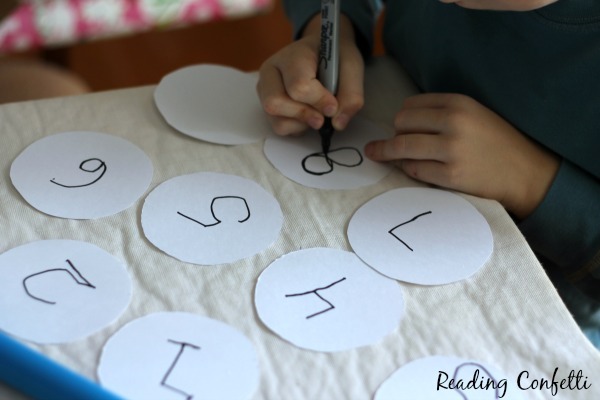 How could I make this a reading or language activity? I love your mini golf course! 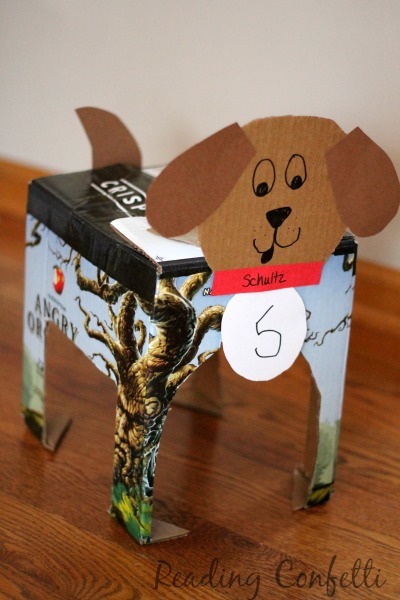 I've included it in my Father's Day Paper Craft round-up. Thanks for sharing your idea!